Facing an immediate future where thousands of jobs will be available in STEM-related fields, UC San Diego’s CREATE co-hosted two science and engineering expos to inspire middle school students and families to get a head start on college careers. Ciencia e Ingeniería con la Familia (Science and Engineering with the Family) is a highly accessible, hands-on event to spark interest in education and careers in the STEM fields (science, technology, engineering and mathematics). The expo is a collaborative effort presented by the CREATE STEM Success Initiative shepherded by CREATE (Center for Research on Educational Equity, Assessment and Teaching Excellence), SPAWAR (Space and Naval Warfare Systems Command) and SHPE (Society of Hispanic Professional Engineers) at UC San Diego and UC Irvine, San Diego State (SDSU) and Long Beach State Universities; and the MAES chapter (Latinos in Science and Engineering) at SDSU. 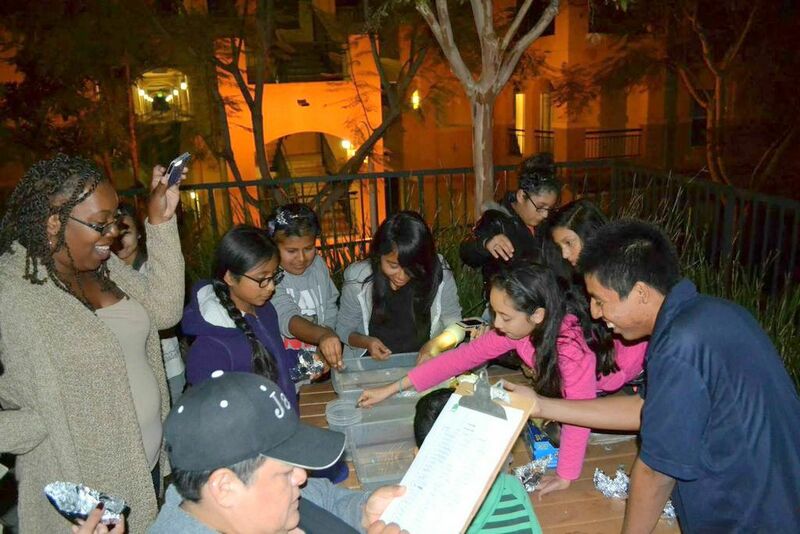 Up to 100 middle school students and family members from UC San Diego’s Preuss School attended the Saturday Nov. 15 event; 30 more attended an evening expo Nov. 19 at La Clase Mágica Community Housing Works at the La Costa Learning Center. 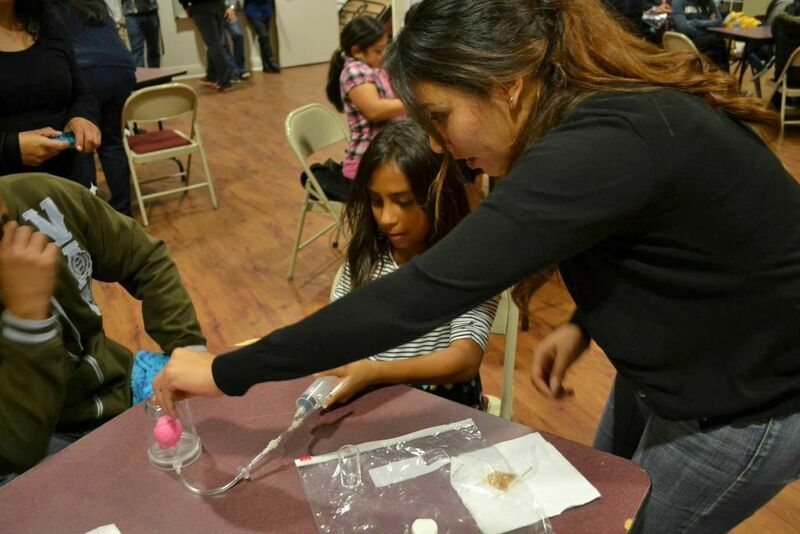 Putting it all together: Parents, students and undergrads from regional SHPE and MAES chapters explore STEM demonstrations at La Costa Learning Center. Sanchez believes the power of Ciencia e Ingeniería con la Familia lies in its ability to reach and engage underrepresented populations in STEM education through its approachable, family-friendly format. Enthusiastic volunteers from UC San Diego’s SHPE program, housed at the Jacobs School of Engineering’s IDEA Student Center, and SDSU’s SHPE and MAES programs staffed more than 12 hands-on demonstrations at each event. “Ciencia e Ingeniería con la Familia is all about raising awareness, igniting interest and empowering students in STEM areas. 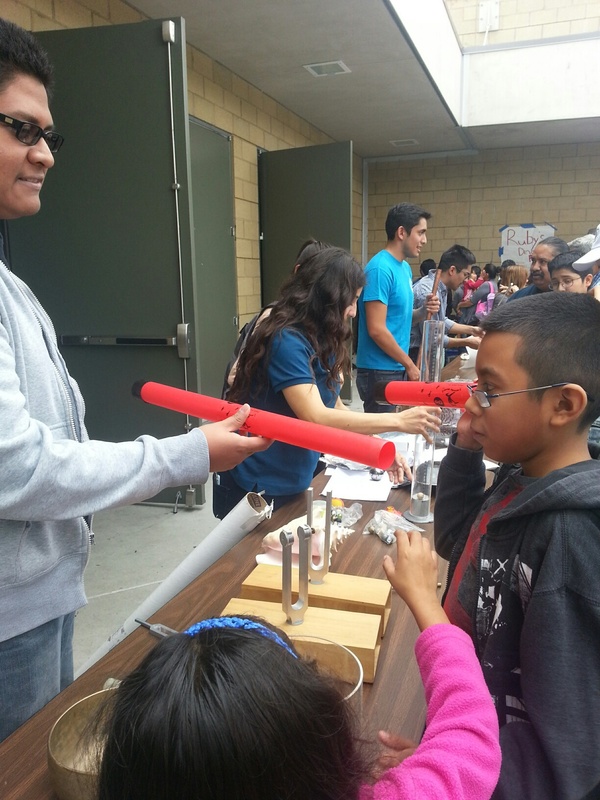 It’s a great way to reach and inspire future engineers and scientists,” added Emily Escalante, an SDSU mechanical engineering major, MAES chapter outreach coordinator and intern at SPAWAR. Can you hear it now? Middle schoolers and their families discover acoustic resonance in different materials at the Preuss School event. While students explore STEM exhibits, parents attend an informative panel discussion featuring professional engineers and university engineering students who answer questions and share insights and personal experiences about their pathways to college and careers. 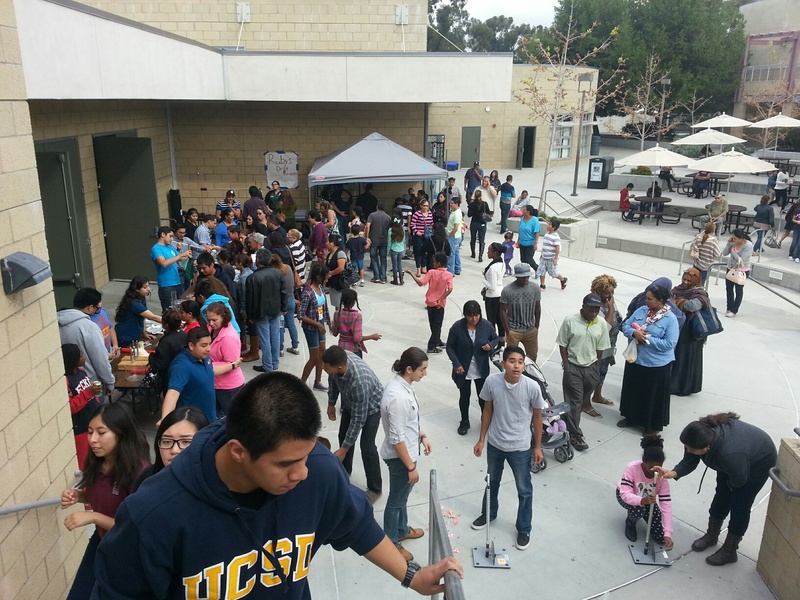 STEM works at Preuss: Students, parents and SHPE undergrads connect at the Nov. 15 expo. Hands-on help: Sandra Telles, program director for La Clase Mágica at UC San Diego, assists with the “outside the box” demonstration at La Costa Learning Center. After the discussion, students unite with their parents and work together on “outside the box,” an interactive project led by Sanchez and Escalante. Dr. James Rohr, SPAWAR Systems Center Pacific scientist and outreach education lead, expressed high praise for Sanchez and her team’s work on Ciencia e Ingeniería con la Familia. 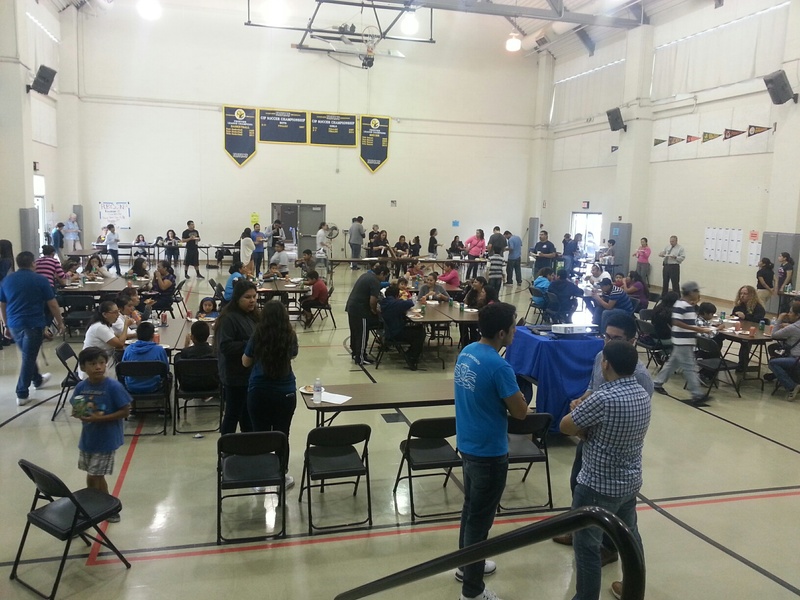 Middle schools and libraries across the county are planning Ciencia e Ingeniería con la Familia events in early 2015. For more information, and to schedule Ciencia e Ingeniería con la Familia for your school or organization, contact Dominga Sanchez at dosanchez@ucsd.edu.